Many terminally ill patients are being denied their wish to die at home, a report by MPs says. The Commons Health Committee says access to specialist palliative care is patchy, and not available to many. The MPs are calling on government to do more to ensure the wishes of dying patients are respected. They also want to see the introduction of a statutory right to a period of paid leave for carers to tend terminally ill people before they die. The right to a good death should be fundamental. The committee found that 56% of terminally ill people would like to die at home - but just 20% actually do. Not only is it socially desirable to allow patients to die at home if that is what they want, it would also produce big savings for the NHS, the report says. The report uncovered wide variations in access to palliative care. Affluent areas were well served by hospices, but less affluent areas had relatively few. People with complex needs, and those from black and minority ethnic communities seem less able to access services, it says. The report also found that although only around one in four people die from cancer, 95% of hospice places are taken by those suffering from the disease. 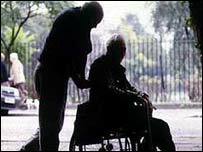 It warns that people terminally ill with other illnesses, such as motor neurone disease or heart disease, are most unlikely to use specialist palliative services. This is an issue that must be addressed in the government's forthcoming national service framework for long-term conditions, it says. The MPs say ministers should reconsider the current system under which health care is free, but social care is means tested. A more integrated system is needed, they say. It is vital that people's needs for domestic help are adequately supported and that aids and adaptations are made in people's homes to allow them to stay there during their last days. The UK could learn from countries such as Canada, where reforms have ensured better and more sensitive palliative care, says the report. David Hinchliffe, chairman of the committee, praised the Department of Health for recently investing over £50m in palliative care services, and pledging to double the number of specialists working in the field by 2015. But he said: "The right to a good death should be fundamental. "Care and respect of those with terminal illness is a key indicator of society's values." "We hear much of the 'choice' agenda in the NHS at present. But for those who are terminally ill, choices are not being realised." Paul Burstow, for the Liberal Democrats, said: "Palliative care is a Cinderella service in the NHS. "Hundreds of thousands of people dying from chronic diseases suffer pain that could be helped by access to the right care. "Much more must be done to develop palliative care to make it available to more people who need it. It is a scandal that as many as 300,000 people a year die from chronic diseases without good palliative support." Tom Hughes-Hallett, chief executive of the charity Marie Curie Cancer Care, welcomed the report. He said: "The committee has thrown down a real challenge to the government to improve end-of-life care. "Ministers must now take on board these realistic recommendations if the government is to deliver on its promise that everyone should have the right to die at home." Jonathan Ellis, of Help the Aged, said: "Government must now take action to simplify the funding of care at the end of people's lives, and to take steps to ensure that palliative care is available to all on the basis of need, not on the basis of where people happen to live."